When the blue beckons, one must answer. 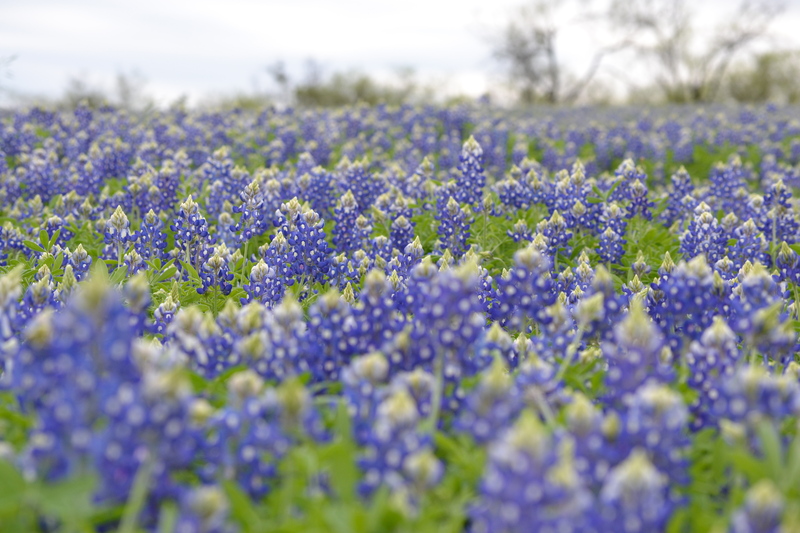 If you have not experienced the sea of bluebonnets in the spring in Texas, put it on your bucket list. This year was truly spectacular. We discovered the ultimate spot a few years ago when we were camping at LCRA’s Muleshoe Bend. I have kept it quiet as it was one of the few remaining secrets of Austin, but Do512 put an end to that recently. Not only were there more people there than I’ve ever seen, there were people collecting entrance fees (it had been honor system), reserved camping spots, and they were paving and building what appeared to be a boat dock in the area we have camped for over a decade. The price of progress. The best way to drown our sorrows? A little more wildflowers and a little wine. We headed down 281 to 290 and we simply can’t be that close to Hye without popping in somewhere. We picked up our shipment at William Chris and then stopped at Hye Meadow Winery. Generally I like to avoid the weekends, especially when my children are in tow. I try to avoid crowds and like to come when there is time to ask questions and spend some time with the wine. Whether it was the threat of rain or the impending holiday, the Saturday before Easter was actually a quiet one. Chris Black greeted us and, as luck would have it, not only was owner Mike Batek there, he was available. I asked Chris to pour whatever he thought I needed to try. It turns out that was a dangerous proposition. I thought it would be a couple whites, a couple reds. In the few years that they have been open, they have greatly expanded their line-up. 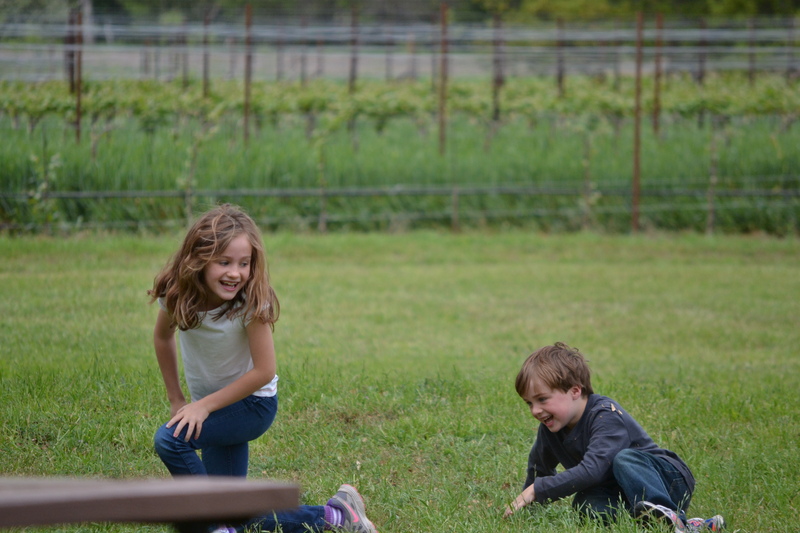 Their goal in winemaking is to take the wine seriously, themselves with levity. All of the whites are gently pressed and fermented in stainless. The reds are primarily Mediterranean grapes which spend less than 30% of time in new oak. While the goal is to be producing 100% Texas wine, they are still sourcing some, mostly from the Northwest. We began with bubbles, Hye-Albert Cuvee. The blend is Chenin and Riesling done in a Charmat style. Always a fun beginning. We moved through a few whites: Trebbiano, Junkyard White (Muscat blanc and Riesling), and Roussanne. It was close. 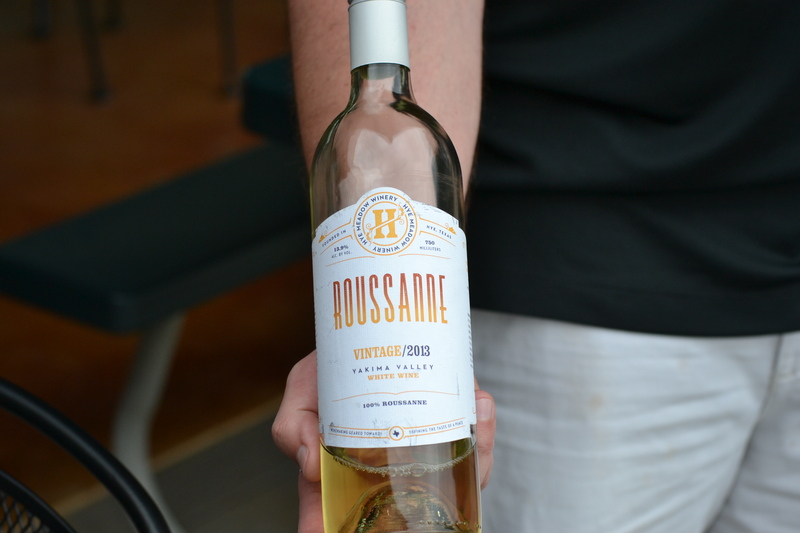 They all were balanced with great aromatics but the Roussanne stood out. Consistently elegant from start to finish. The ombré label was inspired by the grape itself which ripens from the green to the russet. When Mike and winemaker Jeff Ivy were playing with a Tempranillo Rose, Jeff looked at the color and declared that it was “not quite pink.” Thus the name. Junkyared Red is one blend, HyJynx another. A new addition to the line will be a 100% Montepulciano named “The Full Monty.” While they were all tasty, my two favorites were the Sangiovese and the Aglianico, not surprising if you follow my taste in wine. Mike and his wife, Denise, went on a trip through southern Italy with the focus being on Aglianico. The research paid off. Duchman was the first winery in Texas to bring the grape here and I don’t know of any other producers but I hope to see more. Not only are the wines delicious, the space has its own magic. Acres of oaks and a neighboring horse, a swing, yard games. Mike gave my children clues to find a skeleton with a story and there is plenty of room to run. It is hard to say who had more fun. The vision for a winery began with divine inspiration. With each year, each new crop, the inspiration continues. I know I felt it. Many thanks to Chris Black and Mike Batek for spending the afternoon with my family and for sharing your little piece of Hill Country Heaven with all of us. Very nice and interesting post: I didn’t know that there were Aglianico plantings in Texas! Also, kind of unrelated: Lucy is beautiful! Is she a chocolate lab? I mean, of course she’s a lab, but I can’t tell for certain if she’s chocolate or black. She very much reminds me of our own beloved chocolate lab, Sofia 🙂 Looks like she was having a lot of fun among the bluebonnets! She’s a black lab. She’ll be 10 this year. Our first baby. Thanks for reading! What a wonderful day! I have really enjoyed the bluebonnets around Dallas this year too. The cooler temps and bountiful rain has resulting in them popping up everywhere. I hope you have a wonderful time at Austin Food and Wine Festival and I hope you attend that awesome TX wine writers event! Thanks again for your invitation; you are so thoughtful. I hope we can attend next year together! Cheers! I actually haven’t gone to the festival the last couple years. It is an all weekend commitment and very expensive. I like my gluttony in smaller doses ;). What a treat! Now I know where we’ll head for our next weekend family vacation. Looks beautiful and I would love to try their wine. It’s fun to know there’s a lovely place so near my backyard. Enjoyed the post! I don’t know how, but I want to hang out even more in Hye. Great writing!